Small (31.6mm x 24.5mm) 18K yellow gold case, silvered dial with sun-like finish, quartz Cartier calibre 057 movement, 18K gold bracelet. Water resistant to 30 meters. Small (31.6mm x 24.5mm) 18K yellow gold case, silvered dial with sun-like finish, quartz Cartier calibre 057 movement, alligator strap with 18K gold ardillon buckle. Water resistant to 30 meters. 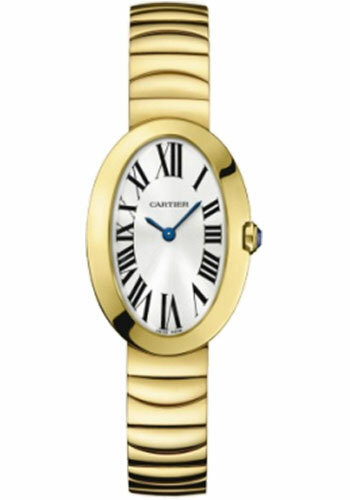 Small (31.6mm x 24.5mm) 18K yellow gold case set with round diamonds, silvered dial with sun-like finish, quartz Cartier calibre 057 movement, fabric strap with 18K gold ardillon buckle. Water resistant to 30 meters.